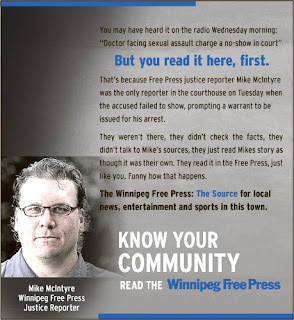 Kenton's Infotainment Scan: Winnipeg Free Press launches ad campaign: what happens next? I also found a typo in today's Free Press, that's nothing new. This ad still doesn't convince me to read the Free Press. They point out their failing on the ad: "You may have it on the radio Wednesday morning..." Actually, I probably heard it Tuesday evening, after the story was posted on the Free Press website. The call to action is to "Know your community, read the Winnipeg Free Press," But they should be emphasizing their website and the fact that news is reported on it 24 hours a day. There's not even a url as a signoff (something that is pretty much a given in any ads we do these days.) They're just making themselves look like the cranky old man on the block who's trying to keep those damn kids off his lawn! "This ad is a risky move. It could be embarrassing if the Free Press is caught not practicing what it preaches."